The Nara period was a period in Japan&apos;s history which, broadly speaking, lasted 84 years from 710 when the Empress Genmei transferred the capital to Heijokyo to 794 when the Emperor Kanmu transferred the capital to Heiankyo. In the strict sense, it lasted only 74 years from 710 to 784 when the Emperor Kanmu transferred the capital to Nagaokakyo. Because the capital (Heijokyo) was located in Nara, it is called the Nara period. From 740 to 745, however, the Emperor Shomu transferred the capital to Kunikyo (Kizugawa City, Kyoto Prefecture), Nanbakyo (Osaka City, Osaka Prefecture) and Shigaraki no Miya (Koga City, Shiga Prefecture) although each one was only capital for a short time. FUJIWARA no Fuhito played an important role in the transfer of the capital to HeijokyoHeijokyo was built as a national centre of politics, mainly inhabited by officials, on the model of the capital of China, Changan. It was an age which aimed, through trial and error, to create ritsuryo kokka (a nation centrally governed in accordance with Chinese-based legal codes), an autocratic nation centered around the emperor and centralized authority. This can be seen in the fact that Taiho Ritsuryo (Taiho Code) - which had been chosen and implemented before the transfer of the capital to Heijokyo - was reviewed and adapted in various ways so that it would be more suitable for real Japanese society. Also, it was a period in which Tenpyo culture (centered around the capital at Heijokyo and the nobles) flourished. In 710, the national capital was transferred to Heijokyo in Nara. The ritsuryo kokka in this period maintained control of the people through koseki (the household registers) and keicho (the yearly tax registers) and imposed soyocho (taxes) and military service. Kentoshi (Japanese envoys to Tang Dynasty China) were frequently dispatched and introduced the culture from the mainland (such as Tang China) to Japan. 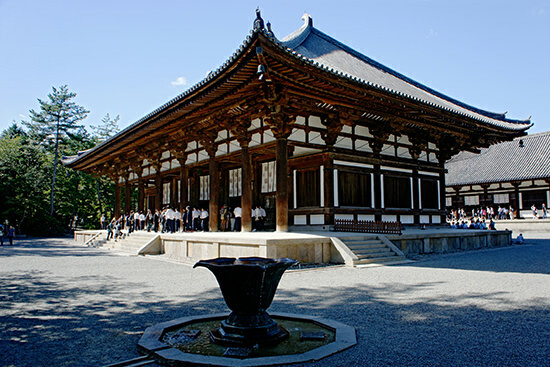 Kokubunji (provincial monasteries) were built all over the country and the Buddhist Tenpyo culture, flourished. 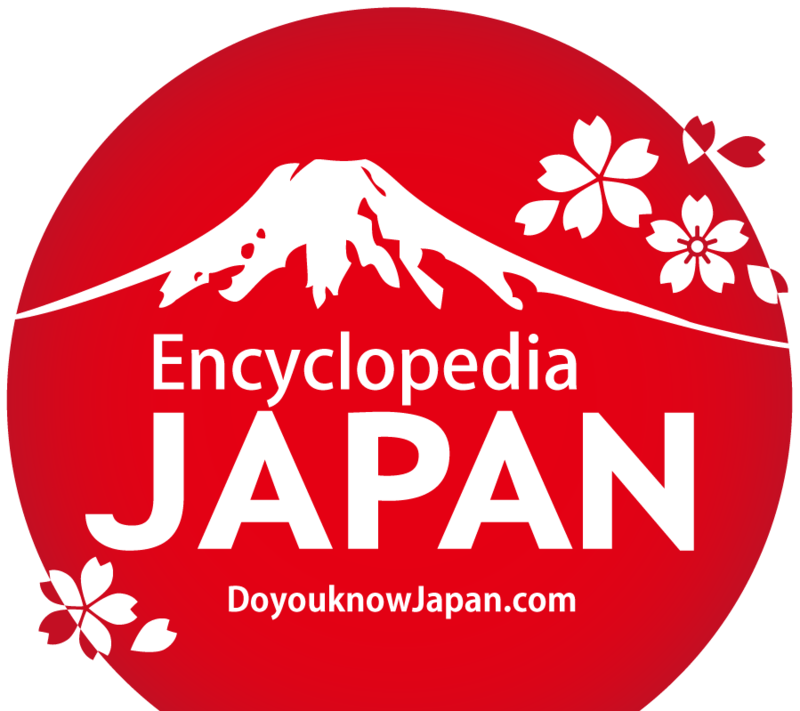 History books and works of literature, which are currently the oldest in existence, such as "Kojiki" (Records of Ancient Matters), "Nihonshoki" (Chronicles of Japan) and "Manyoshu" (Collection of Ten Thousand Leaves) appeared. In this period, many political strifes occurred in the central government and in Tohoku there were never-ending wars with Ezo. From a political history viewpoint, the period can be divided into three: the Early Stage from the transfer of the capital to Heijokyo in 710 to Nagayao no hen (conspiracy of Prince Nagaya) in 729, the Middle Stage from the arbitrary exertion of power by four brothers of the Fujiwara family to the rebellion by FUJIWARA no Nakamaro in 764, and the Later Stage from administration by Dokyo and the Empress Koken (also known as Shotoku) onwards. The Tang Dynasty, who took over from the Sui Dynasty and unified China in 618, built a large empire and controlled a vast territory in East Asia, exerting a strong influence on the neighboring areas. There was also active exchange with West and Central Asia and the capital Changan flourished as an international city. The first half of the era of Emperor Xuan Zong (Tang) was called &apos;Kaigen no chi&apos; (this term refers to the political stability of the Tang Dynasty during his reign). Various countries around China had friendly relations with Tang and the East Asian cultural sphere was formed with shared cultural features such as Chinese characters, Confucianism and Buddhism translated into Chinese. Japan, included in this group of small empires, had a system of ritsuryo kokka, where the emperor was in a position comparable to the emperor of China and Japan had an imperial structure in which Japan was regarded as the center of the world, similarly to Tang. It was a country worthy of the name &apos;small empire of eastern barbarians&apos; and classified its sphere of sovereignty as &apos;kenai,&apos; everywhere outside of this as &apos;kegai&apos; and further classified kegai into Tang (defined as a &apos;neighboring country&apos;) &apos;shoban&apos; (literally, miscellaneous barbarians, consisting of kingdoms in Korea: Silla and Balhae in this period) and &apos;Iteki,&apos; including Ezo (northerners), Hayato (an ancient tribe in Kyushu) and inhabitants in southern islands. Whilst these classifications were set forth in ritsuryo codes, boasted about and strived for, it&apos;s another question altogether whether they were actually realized in the relationship with Tang and the Korean kingdoms. Kentoshi (Japanese envoys to Tang Dynasty China,) starting with INUGAMI no Mitasuki in 630, were dispatched roughly once every twenty years in the Nara period. The envoys consisted of approximately 500 people (including the chief, scholars and monks sent to Tang to study) and they made the voyage to Tang with four vessels. Although Japan did not receive sakuho (homage by the Chinese emperor) from Tang, it was essentially treated as a tributary state which served Tang as a subject. Envoys attended Choga (a New Year&apos;s greeting to the emperor by retainers) and celebrated the emperor. However, ship building technology and the art of navigation at the time were still fairly amateur, and shipwrecks were not uncommon. Although such risks were involved, these envoys were incredibly influential to Japan at the time, by bringing back large numbers of books and high quality textiles, silverware, porcelain and musical instruments and also introducing advanced political systems and the international culture of Tang. It is recorded in the official history of Tang that their thirst for knowledge in particular was so insatiable that some people from Japan sold goods bestowed by the emperor and spent all the money to buy books to take back to Japan. It was not only products of culture that were brought back; scholars and monks who obtained knowledge in Tang returned to Japan and played leading roles. In particular, when KIBI no Makibi and Genbo returned from Tang they were given important posts by the Emperor Shomu and were also active in the political world in Japan. Many envoys came and went between Silla, the kingdom that had unified the Korean Peninsula after the Battle of Hakusukinoe (Battle of Baekgang). However, despite the fact it had consolidated its national strength, Japan still considered Silla as a &apos;barbarian country,&apos; and tended to treat it as a dependent, thus relations between two countries became tense from time to time. Because of this, the envoys&apos; route had to be changed several times. In order to keep Tang, a factor hindering unification of the peninsula, in check, Silla pretended to obey to Japan until the beginning of the eighth century. After the formation of Balhae, relations between Silla and Tang developed favorably and Silla began insisting on equal diplomatic relations, but Japan did not consent. The two countries&apos; worsening relationship started to manifest itself in reality. Silla built a castle (毛伐郡城) in 723 to prepare for a Japanese invasion and, Japan temporarily installed a setsudoshi (military governor) to strengthen armaments. In 737, a punitive expedition to Silla was discussed, but due the successive deaths of FUJIWARA no Muchimaro and his three brothers it was not materialized. In 755, when the Anshi Rebellion occurred and Tang was thrown into disorder, FUJIWARA no Nakamaro made preparations for a punitive war against Silla, based on Japan&apos;s strengthening relationship with Balhae (who posed a serious threat to Silla). (This time also, it was not realized because of fall of Nakamaro. )In this way, although no conflict occurred, envoys from Silla were discontinued after the final embassy in 779, due to Silla&apos;s rising sense of national greatness and prestige. Meanwhile, Silla concentrated on private sector trade. Interaction with Japan was greater than with Tang in terms of both quality and quantity. It is believed that many of treasures from Tang and southern countries currently kept in the Shosoin (treasure repository) were mediated by merchants of Silla. Around the end of eighth century, Japanese envoys to Silla were discontinued, but merchants of Silla intensified their activities. Even today there are various theories as to what kind of people the Ezo were. Whatever they may have been, for the ritsuryo kokka based on Sinocentrism, Ezo was &apos;simply a concept of people who were out of their control. &apos;In the middle of the seventh century, ABE no Hirafu and others made expeditions and it is believed that they reached as far as present-day Akita and Tsugaru regions or even further North. However, only Shonai region in present-day Yamagata Prefecture and areas south of central Miyagi Prefecture were stably incorporated into ritsuryo kokka at the beginning of the eighth century. At that time, castles and josakukanga (a castle-like facility used as governmental office) were constructed and people called Kinohe, forced to immigrate from Kanto and Hokuriku regions, lived around such castles and josakukanga, and were engaged in farming. Koriyama ruins (Sendai City, Miyagi Prefecture) is considered to have been the central governmental office at that time. Since around the time of the transfer of national capital to Heijokyo, the government adopted a policy of rapid expansion. 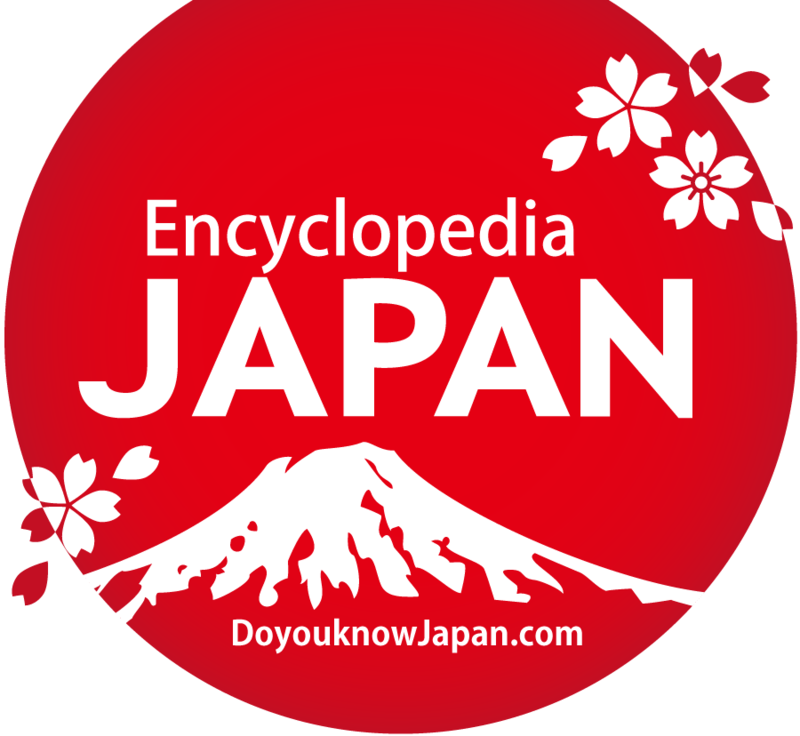 In 708, Dewa County was established in Echigo Province and it was transformed into Dewa Province in 712. People from Tokaido and Tozando regions were moved to castles and josakukanga and forced to be engaged in farming and defense. In response, Ezo started a revolt in 709 and 720 and, in 720, KAMITSUKENO no Hirohito, who was the Mutsu no azechi (Inspector of Mutsu), was killed. The government deployed large-scale troops and subdued the revolt. The government established a county and a josakukanga, then constructed a Taga-jo Castle as a facility to supervise them. On the Japan Sea side, Dewa no saku was relocated to the present Akita City (later Akita-jo Castle) in 733. Later, the government appointed the chief of Ezo as a gunji (region manager) in order to indirectly control tribal groups, and forced people individually picked out for subjugation to migrate to other countries as fushu (barbarians). Thus, the southern part of the Tohoku region was gradually incorporated into the ritsuryo system. However, the northern part of the Tohoku region and further northwards were out of the ritsuryo kokka&apos;s control. Nevertheless, cultural and economic contacts continued and, in the Satsumon period, a Makki (Ezo-style) tomb was constructed inspired by tombs in the Dewa region and Wado Kaichin coins have been unearthed in Eniwa City. In the first half of the Nara period, Taiho Ritsuryo - drafted by Osakabe no Miko (Prince Osakabe) and others and completed and enforced in 701 - was the fundamental law of Japan. In 718, FUJIWARA no Fuhito and others were ordered to draft a new Yoro Ritsuryo (Yoro Code). It was mainly revision of words and clauses and its basis was Taiho Ritsuryo, however its enforcement was delayed until 757, under the leadership of FUJIWARA no Nakamaro. The authority to establish and abolish government posts and official court ranks for nobles and officials, the right to appoint Ryoge no kan (a new governmental post), the authority to bestow court rank and to appoint officials, all rights of leadership and command towards army corps, soldiers and goefu (Palace guards), the right to make imperial judgment and right to grant general amnesty with respect to punishments under ritsu codes - these were based on the principle of legality, diplomatic rights such as right to use shochoku (the Imperial edict) on envoys to and from foreign countries and right to decide on succession to the Imperial Throne. Around 762, OMI no Mifune selected and presented Chinese-style posthumous names for emperors in the past. With this, the title of "emperor" which was believed to have been established in the era of the Emperor Tenchi or the Emperor Tenmu (seventh century) were retroactively given to emperors before them. The enactment of Taiho Ritsuryo formed a nation managed under ritsuryo system. The organization of the central government consisted of two departments and eight ministries, danjodai (Board of Censors) and goefu. Local administrative organizations were standardized as kuni (Province), gun (County) and ri. Later, ri was changed to go. In addition, as Goki shichido (lit. "five provinces and seven circuits," the name for ancient administrative units), the whole region was divided into kinai (provinces surrounding Kyoto and Nara), the &apos;seven circuits&apos; of Tokaido, Tozando, Hokurikudo, Sanindo, Sanyodo, Nankaido and Saikaido, which were divided into 66 provinces and two islands, Iki Province and Tsushima Province. (Refer to the list of kuni (Provinces) under the ryo system)A military corps was deployed to each province and controlled by kokushi (provincial governors). Kochi Komin system, under which rice fields and people belonged to the nation, was adopted and handen (allotted farmland) was provided in accordance with the family register. Taxes were composed of so, yo, cho and zoyo. In 742, Dazaifu was abolished, chinzeifu being established the next year, but in 745, Dazaifu was reestablished. In the Tohoku region, Taga-jo Castle, Dewa no saku, etc. were established and the subjection of Ezo (indigenous inhabitants in eastern Japan), development, and implantation were carried out (as described above). In order to maintain a highly systemized bureaucratic organization, ritsuryo kokka codes needed stable revenue from taxes. On the other hand, handen shuju no ho (literally, law concerning receiving and giving handen) in Japan had no clear provisions on how to treat newly reclaimed rice fields. As a result, the Imperial Court lead by Prince Nagaya established a plan in 722 to reclaim a million hectares and, in order to ensure successful execution of the plan, enforced a law called Sanze Isshin no Ho in 723. According to this law, those who constructed new irrigation facilities could retain reclaimed rice fields for three generations and those who used existing ponds and ditches could retain them for their lifetime. However, it did not work as motivation for farmers to reclaim rice fields and thus it did not progress as expected. Therefore in 743, the government led by TACHIBANA no Moroe enforced Konden Einen Shizai Ho aiming to promote reclamation of rice fields. This system granted permanent ownership of rice fields (with certain restrictions) to any person who applied to their kokushi (provincial governor) for permission to carry out reclamation within a specified time period. These two laws were no doubt intended to undermine the basis of the kochi komin system, but it was a fact that they aimed to rebuild the ritsuryo system by securing handen (also known as kubunden - the land given to each farmer in the Ritsuryo system). Ownership of land by nobles, powerful clans and temples and shrines - all of whom had capital to carry out reclamation - increased continuously. In particular, powerful nobles and temples fenced off vast lands and increased privately owned land by using ordinary farmers and furonin (people escaped from their registered domiciles). This was the origin of shoen (manor in medieval Japan). Shoen were mainly Yusoden, which were rice fields subject to taxation, and known as shoki shoen (literally, shoen in initial stage). In January 708 which was the year after the enthronement of the Empress Genmei, the name of the era was changed to &apos;Wado&apos; (literally, "Japanese copper") after the presentation of copper from Musashi Province and, in February next year, production of coins and construction of the capital commenced. On February 11, a Saijusenshi (a Ryoge no kan in charge of administering coinage) was appointed and, on February 15, the imperial edict for transfer of the national capital to Heijokyo was issued. According to the &apos;Imperial Edict for Transferring the National Capital to Heijokyo,&apos; the new capital was &apos;方今、平城之地、四禽叶図…&apos; and &apos;四神相応の地&apos; was chosen. Fujiwarakyo (the imperial capital of Japan for sixteen years between 694 and 710) was located on a slope running from the south to the north. It is sometime assumed that it was moved away because Fujiwara no Miya (Fujiwara Palace) was at a lower level than the area where their subjects lived, and thus subjects could look down the capital. In addition, there were practical problems such as poor drainage. However in addition, because Fujiwarakyo was constructed in a period when interaction with Tang was disrupted, it seemed to have been designed in accordance with the old book ("Shurei (Rites of Zhou)") and it has no comparable example among capitals of China of the era. In reality, however, it seems that when AWATA no Mahito, who was an envoy to Tang China, returned to Japan after over 30 years and joined the Imperial Court government, such problems became clear. Also, his reporting on culture, power of the nation and the dignity and prosperity of the capital, Changan, of Tang made the government conscious of the large difference between Fujiwarakyo and Changan, which resulted in the decision to transfer the capital. The basis for this decision was that construction of a grand capital would show emperor&apos;s virtue to foreign envoys, frontiersmen such as Ezo and Hayato, and local clans and people. Domestically, its aims were simply consolidation of centralized control and creation of a little &apos;Chinese-style empire&apos; by eastern barbarians. 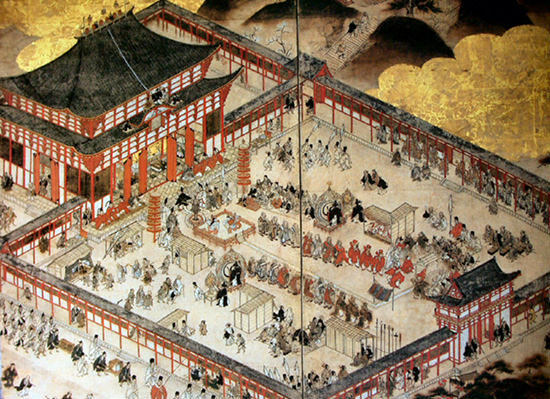 In September, the Empress Genmei made an inspection of the site of Heijo and appointed 17 officials including the chief of zoheijokyoshi (office for construction of Heijokyo). In October, she dispatched an imperial envoy to Ise-jingu Shrine to report on the construction of the new capital. In November, she provided grain and cloth to families who were forced to move from the site of Heijo-kyu Palace. In December, a ground-breaking ceremony was held and construction work commenced. In this year (708), FUJIWARA no Fuhito, who led the transfer of the capital, was promoted to Shonii Udaijin (Senior Second Rank, Chief of the Imperial Japanese Council of State) and his second wife, Agata no INUKAI no Michiyo, was given the family name of &apos;Tachibana no Sukune&apos; together with a tachibana (mandarin orange) floating in a cup on the occasion of Daijosai (first ceremonial offering of rice by newly enthroned Empress). As names related to place names or official duty were popular, it was rare for plants to be used as family names, and Imperial princes she bore used the name of Tachibana and became the founders of the Tachibana clan. 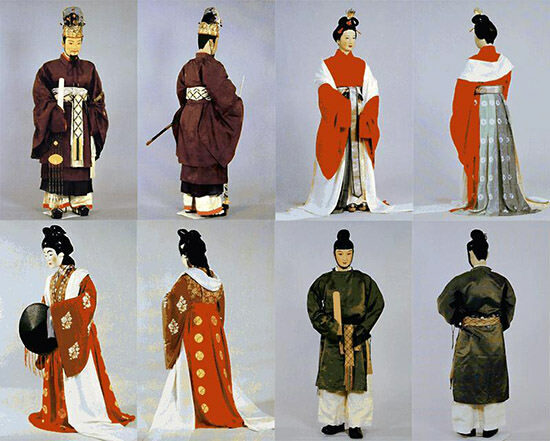 Prince Katsuragi, who changed his name to TACHIBANA no Moroe as such and Komyoshi (Empress Komyo), who became empress later, were older maternal half-brother and younger maternal half-sister. Construction work for Heijokyo was carried out in an extremely short time period. In April 710, 16 months after the commencement of construction work, transfer of the capital to Heijokyo was conducted. The reason why transfer of the capital could be made so rapidly was that many buildings including temples were relocated from Fujiwarakyo. According to recent findings, the scale of the new capital, Heijokyo, was almost same as the old capital Fujiwarakyo, in fact Fujiwarakyo was even greater although compared to Chang&apos;ancheng, it was not even one quarter of the size. A unique point of Heijokyo was that a section called &apos;gekyo&apos; protruded to the East, therefore the outer shape of the capital was not completely square. Gekyo&apos; has become the central part of present-day Nara City. Buildings in Heijokyo were not limited to Tang style; there were many buildings of traditional Japanese style, warehouses on stilts supported by pillars dug into the ground, with wooden plate floors and hiwadabuki (cypress bark) roofs known as takayukashiki-soko. Construction of the capital was carried out in a short time period, and production of coins was also carried out speedily. In February 708, a Saijusenshi (A Ryoge no kan in charge of administering coinage) was appointed and in May the same year, silver coins of Wado Kaichin were issued with copper coins coming in August. The reason silver coins were issued earlier is believed to be the tradition of circulation of silver coins as Hyoryo kahei (currency valued by weight). It the same way as Heijokyo was a developed form of Fujiwarakyo of the Emperor Jito&apos;s period, Wado Kaichin was also a developed form of Fuhonsen coins and also followed the example of Tang coinage. The coins were used to pay costs involved in building the capital, such as construction workers&apos; wages. In November 711, in an attempt to promote its circulation, the government issued the Chikusen joirei which gave Ikai (Court rank) to persons who saved up a specified amount of coins. However, outside of the area around Fujiwarakyo and Kinai, trade based on material currencies such as rice plant and cloth was widely conducted. Chikusen joirei was a kind of Baikan sei (system of selling government posts) and, therefore storing away of coins was promoted all the more, sometimes hindering the smooth exchange of currency. The government continued to manufacture copper coins and, until the issue of the new currency Kengen Taiho in the tenth century, as many as 12 rounds of production were carried out. These coins were called Kocho-Junisen (twelve coins of the Imperial Court). On the other hand, Shichusen kinshi rei (the ban on counterfeiting money) was issued on 708, the same year as that of the manufacture of Wado Kaichin. In order to prevent government officials counterfeiting coins in order to obtain Ikai (Court rank), any person who manufactured counterfeit coins was punished with removal of official rank and &apos;zan&apos; (execution by decapitation). At the beginning of this era, FUJIWARA no Fuhito, son of FUJIWARA no Kamatari, grasped the reins of government and devoted himself to establishing the ritsuryo system and strengthening the foundation of Fujiwara clan expansion through links to the Imperial Family. After Fuhito died, Nagayao, son of Takechi no Miko (Prince Takechi) and grandson of the Emperor Tenmu, grasped the reins of government. He was promoted to udaijin (minister of the right) and flaunted his power. Around that time, however, vagrancy and defection of heavily-burdened farmers increased and social unease came to the surface. Therefore, the government promoted land reclamation by enforcing Sanze Isshin no Ho in 723 to secure revenues. From around 724, Emperor Shomu, whose mother was the daughter of Fuhito, FUJIWARA no Miyako, as well as four Fujiwara brothers and sons of Fuhito, FUJIWARA no Muchimaro, FUJIWARA no Fusasaki, FUJIWARA no Umakai and FUJIWARA no Maro appeared in the political world. In 729, the four brothers of Fujiwara slandered Nagayao, who had been promoted to sadaijin (minister of the left) as &apos;endangering the nation with the ways of the left&apos; and forced him to commit suicide (an event known as Nagayao no Hen), grasping the reins of government. 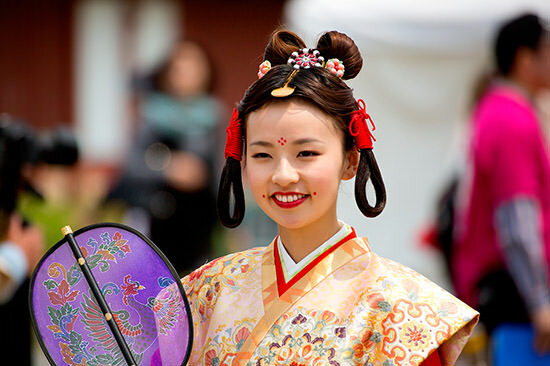 Immediately after the disturbance, the Fujiwara clan succeeded in making a daughter of Fuhito, Komyoshi (Empress Komyo), the first retainer to become Empress. After the four Fujiwara brothers died one after another in 737 because of an epidemic of smallpox, TACHIBANA no Moroe, who was from the Imperial Family, assumed control of the government by making SHIMOTSUMICHI no Makibi (later KIBI no Makibi) and the monk Genbo participate in the government. FUJIWARA no Hirotsugu, the oldest son of Umakai, was unhappy with such a situation, and raised an army in Kyushu in 740 with the pretext of removing Makibi et al, but was defeated and died (Rebellion of FUJIWARA no Hirotsugu). The central government was terribly shocked with this rebellion and the Emperor Shomu transferred the capital repeatedly to Kuni in Yamase, Nanba in Settsu and Shigaraki in Omi. Partly because of construction works for repeated transfers of the capital, people&apos;s emotions got further confused, and, as epidemics and natural disasters continued, social anxiety was further increased. 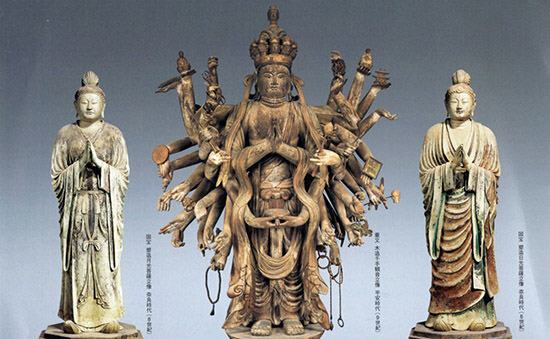 The Emperor Shomu, who was a deep believer in Buddhism, wanted to settle social unease based on the ideology of Chingokokka (keeping the nation tranquil by the reciting of Buddhist prayers and other Buddhist ceremonies) and issued in 741 an Imperial edict establishing Kokubunji (state-supported provincial temples) and, in 743, an Imperial edict for construction of Rushana daibutsu (a large statue of Buddha). Under the imperial edict, Rushana daibutsu of Todai-ji Temple was constructed and completed in 752, and a big kaigenkuyo (ceremony to consecrate a newly made Buddhist statue or image by inserting the eyes (thereby investing it with soul)) was held in the presence of the Empress Koken and the former Emperor Shomu. In the meantime, FUJIWARA no Nakamaro (son of Muchimaro) from the Southern House of the Fujiwara clan, who successfully gained the confidence of the Empress Komyo, accumulated power and organized a Shibi chudai (office responsible for affairs of the Empress Komyo). In 755, he took over control of the government from TACHIBANA no Moroe and in 757 he ousted TACHIBANA no Naramaro, who was a son of Moroe (TACHIBANA no Naramaro no hen). Nakamaro used the Emperor Junnin as a puppet to obtain autocratic power, changed his name to EMI no Oshikatsu in the Tang style and promoted Chinese-style administration based on Confucianism. Soon, the monk Dokyo came onto the scene having successfully won the favor of the Retired Empress Koken. Oshikatsu initiated a revolt to remove Dokyo in 764 but was defeated and died. By this, the Emperor Junnin was decrowned and exiled to Awaji. In 765, Dokyo became daijodaijin zenji (grand minister of state and master of Zen Buddhism) and the next year, the Emperor of Buddhist Law. He promoted family members and trusted monks to high positions and constructed Saidai-ji Temple (Nara City) and Hyakumanto stupa aiming at stabilization of the reins of government. The Empress Koken/Shotoku (who had previously retired but was restored) along with Dokyo, insisting that a Shintaku (oracle) of Usa Hachimangu Shrine) had been handed down, tried to appoint Dokyo as heir to the Imperial Throne but they were stopped by FUJIWARA no Momokawa and WAKE no Kiyomaro, and after the Empress Shotoku&apos;s death in 770 Dokyo fell from power. In place of him, FUJIWARA no Nagate from the Northern House of the Fujiwara clan, FUJIWARA no Yoshitsugu and FUJIWARA no Momokawa from the Ceremonial House of the Fujiwara clan made rapid progress. The Emperor Konin did not belong to the line of the Emperor Tenmu but he was a descendant of the Emperor Tenchi. The Emperor Konin paid attention to fiscal restraints, for example, by decreasing the number of officials and cleaning up of local administration by strictly controlling kokushi and gunji. However, resistance by Ezo in the Tohoku region became stronger as seen in the revolt of 780 by KOREHARI no Azamaro in Mutsu Province. In 784, the Emperor Kanmu constructed a new capital (Nagaokakyo) in Nagaoka in Yamashiro Province in order to free himself from the influence of temples and shrines which had been getting more and more powerful. After FUJIWARA no Tanetsugu, who was responsible for its construction, was assassinated, and Imperial Prince Sawara, the Emperor Kanmu&apos;s younger brother, was arrested, a new capital named Heiankyo was constructed and transferred in 794 and the characters from Yamashiro Province were changed from 山背国 to 山城国. With this transfer of the capital, the Nara period completely ended and the Heian period commenced. The government dispatched scholars and monks to Tang and assimilated various aspects of their culture. Interaction with Korean Peninsula was also very active. One can discover a fragment about these traded goods from treasures in Shosoin. In 716, ABE no Nakamaro (who died in Tang China), KIBI no Makibi and the monk Genbo, were dispatched to Tang to study. They brought back various forms of culture to Japan at the time. Compilation of the "Kojiki" (Records of Ancient Matters) and the "Nihonshoki" (Chronicles of Japan), fudoki (description of regional climate, culture, etc. ) and "Manyoshu. "The "Kojiki," which is believed to have been completed in 712, was a record of histories which the Emperor Tenmu ordered HIETA no Are to memorize based on &apos;Teiki&apos; (records of Emperor&apos;s family tree) and &apos;Kyuji&apos; (a record of stories current at court) and recorded by O no Yasumaro. 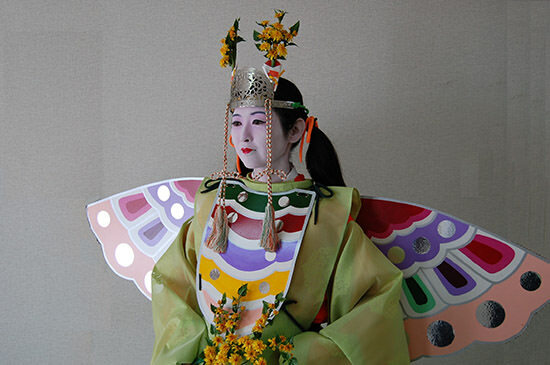 It contains myths and traditions and stories up until the Empress Suiko and it also recorded a large number of songs. It described spoken Japanese language using on (the Chinese-derived reading of a Chinese character) and kun (the Japanese reading of a Chinese character). In contrast, for the "Nihongi (Nihon Shoki)," composed of 30 volumes and a roll of genealogical chart, compiled and offered to the emperor in 720, KI no Kiyohito and MIYAKE no Fujimaro in 714 selected accounts from provincial historical literature from the mythological age to the Empress Jito, and then Imperial Prince Toneri and his assistants edited the work. This followed the form of history books of China and was presented in the Chinese way using chronological order. After that official histories in classical Chinese up to "Nihon Sandai Jitsuroku" were edited and collectively called &apos;Rikkokushi&apos; (Japan&apos;s six national histories chronicling the seventh and eighth centuries) of which "Nihonshoki" was the first. In 713, the government ordered to each provision to edit &apos;Fudoki. &apos;These were local reports which were composed of descriptions of local products, natural features such as mountains and rivers as well as their history and legends as told by old people. "Izumo no kuni fudoki" (the local reports of Izumo Province) still exists in its almost complete form and a part of each fudoki from Hitachi Province, Harima Province, Bungo Province and Hizen Province still remains. They constitute precious works of literature (historical sources) which show local situations in ancient times. In the field of literature, the oldest existing collection of Chinese poems "Kaifuso" (Fond Recollections of Poetry) was edited in 751, containing Chinese poems from the latter half of the seventh century and on, including poems by the Emperor Kobun, Prince Otsu, the Emperor Monmu, and Prince Nagaya. OMI no Mifune and ISONOKAMI no Yakatsugu were famous as poets of Chinese poems representing the middle of the Nara period, and although it is inferred that one of them was involved in editing of "Kaifuso," there is no definite evidence. In the world of Waka, many poets such as YAMANOUE no Okura, YAMABE no Akahito, OTOMO no Yakamochi and OTOMO no Sakanoue no Iratsume appeared one after another from the Wado to Tenpyo era. "Manyoshu" is a collection of about 4,500 poems up until 759 and a poem by the Emperor Yuryaku is placed at the front. 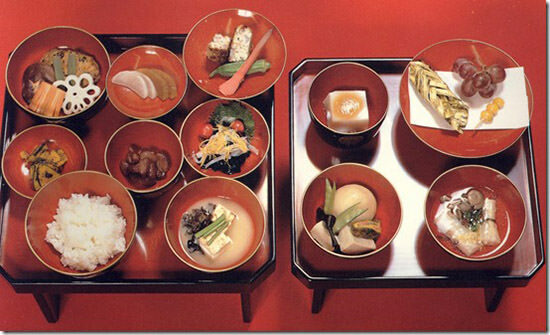 It contains Waka from the Nara period (after the reigns of Emperor Jome and Empress Suiko) and the Nara period. The Waka are not only by famous poets and court nobles, but also many poems showing unassuming sentiments of local farmers such as azumauta (poems in ancient Japan in the dialect of the eastern region) and sakimori-no-uta (poems by soldiers deployed for boarder defenses) and many of the latter are excellent ones which appeal to human sentiment. Its significant feature is the use of Manyo-gana (a form of syllabary used in the Manyo-shu) which describes Japanese language by combining on and kun readings of Chinese characters. In the Nara period, Buddhism developed thanks to protection by the government as well as the ideology of Chingo kokka and Hoe (Buddhist mass) and prayers to protect the nation were often held. 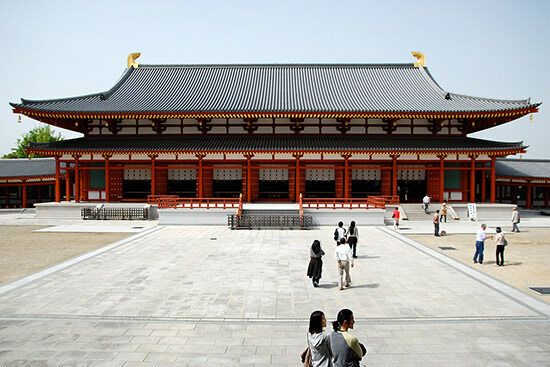 The government built large temples in Heijokyo and, in 741, the Emperor Shomu issued an imperial edict to each Province and made them build kokubunji and kokubunniji. 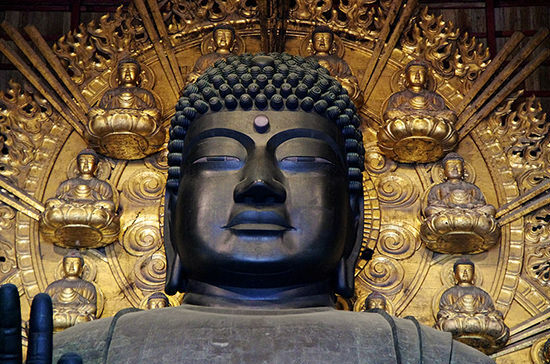 They also constructed Todai-ji Temple, naming Roben as its founder and, in 743, ordered construction of the statue of Birushana Buddha in Todai-ji Temple (Daibutsu) praying for a peaceful nation. 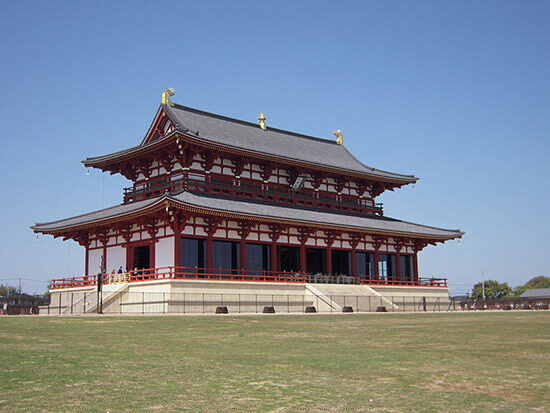 Construction of daibutsu commenced in Shigaraki no Miya Palace. 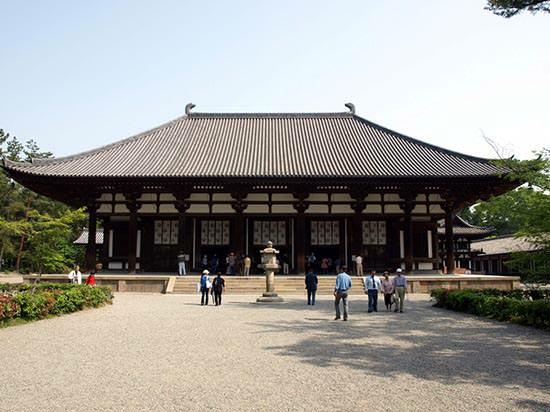 In 752, Retired Emperor Shomu Daijo, the Empress Komyo and his daughter Empress Koken visited Todai-ji Temple and held a ceremony to consecrate the daibutsu. 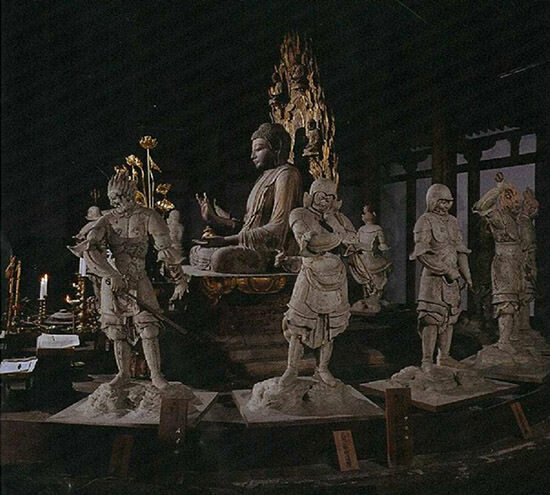 Empress Koken was enthroned again as Shotoku and constructed Saidai-ji Temple (Nara City). 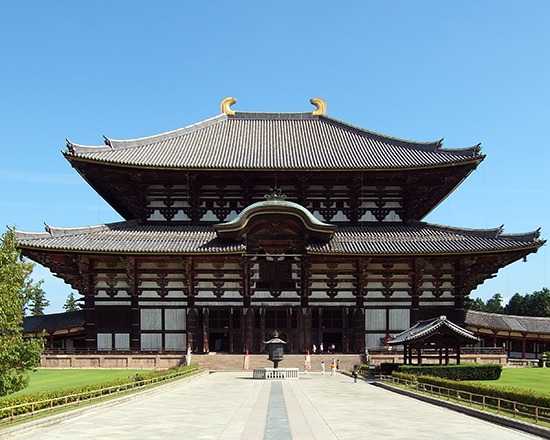 Monks studied Buddhist theory in the Seven Great Temples of Nara (Daian-ji Temple, Yakushi-ji Temple, Genko-ji Temple, Kofuku-ji Temple, Todai-ji Temple, Saidai-ji Temple and Horyu-ji Temple) and sects called Nanto rokushu "six Nara sects" (Sanron sect, Jojitsu sect, Hosso sect, Kusha sect, Kegon sect, and Ritsu sect) were formed. Large-scale copying of sutras was conducted and, Empress Komyo&apos;s order for a complete copy of all Buddhist scriptures was a great undertaking comparable to construction of daibutsu and kokubunji. Development of Buddhism was owed largely to the efforts of gakumonso (literally, studying monks) such as Doji (of the Sanron sect) and Genbo (of the Hosso sect) who accompanied the envoys to Tang to study. It also owed to activities of foreign monks such as Ganjin (Jianzhen) wajo from Tang who arrived in January 754 in Heijokyo on his sixth attempted voyage to Japan and introduced the precepts of Buddhism, bringing a large number of Buddhist scriptures, Bodai Senna from India who acted as Kaigan doshi (an officiating priest to consecrate a newly made Buddhist statue or image by inserting the eyes) for the daibutsu, Buttetsu, a monk from the kingdom of Champa (Lin Yi, a former name for Vietnam) who came to Japan at the same time as Tang monk Bodai Senna (Dosen) and a large number of monks from Silla. While protecting Buddhism as a state religion, the Imperial Court controlled it strictly with laws and regulations such as Soni ryo (Regulations for Monks and Nuns) and restricted private missionary activities by stipulating procedures and qualifications to become a monk or nun. On the other hand, there were monks such as Gyoki who violated these restrictions and preached to the general public, and, although he was suppressed, he was also supported by general public for his efforts in social work such as provision of irrigation systems and fuseya (aid station or rest house) as well as road construction. 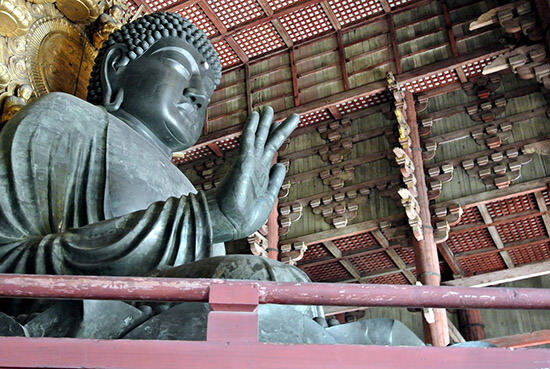 In the end, the government noticed Gyoki&apos;s popularity and took him on, promoting him daisojo (a Buddhist priest of the highest order) for his efforts and contribution to construction of daibutsu. Others who carried out social works include Dosho (founder of the Hosso sect) who was Gyoki&apos;s teacher and said to have built Uji-bashi Bridge, the Empress Komyo who established Hidenin and Seyauin to give relief to poor people, and WAKE no Hiromushi who brought up a large number of orphans.